You'd think that the story of a little company that grew from a shared nostalgic interest to a pop culture phenomenon would be a terrific watch...sadly wrong, so sadly. 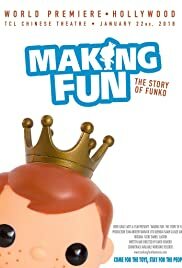 The tone of Making Fun: The Story of Funko is slow and quiet, which is actually fine as the viewer can't help but think that the slow and quiet will build to some emotional or informational climax, but it just stays quiet never quite makes the gut-connection required to make watching this documentary worth the time. Stretches of it are border-line straight-up boring and others are oddly disjointed and not terribly concerned about contributing to a larger narrative. It's actually pretty surprising. The viewer gets plenty of backstory on the Funko company, its origins, its employees and volunteers, its evolution, its fans, its celebrities (as both fans and POP Funko subject matter), its unique and colorful products, its popularity in the collectibles market, and its future aspirations; and it is simply shocking that all of that does not add up to an interesting documentary. They even throw in a story to wrench the heart towards the end, but it feels manipulative and trumped up to justify the time spent on the Funko tale. This could have been so much better.